Gabriella’s works focus on the concept of relationship when transforming artworks in the moments of meeting/confrontation among individuals. She believes art as a catalyst for social change, an ideal testing ground that could become a public space. Studying the landscape and observing nature always attract her. She studies the dynamics of formation, which gives her inspiration to create drawing. 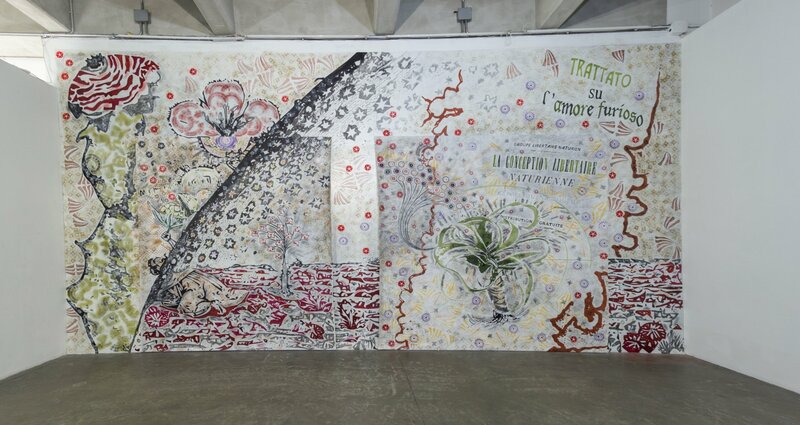 In her recent art works, she analyzes the relationship between human beings and plants in nature. This is an invitation to a dialogue on the concept of resistance and freedom, which applies to the relation with the environment. She is experiencing Social Ecology theorized from Murray Bookchin, by involving the community in the creation of the work and the transformation of a place in a space where freedom can be experienced, breaking the hierarchy between artists and visitors. The process of creation serves as a library or archive, as a collection of her memories. She studies the iconographic botany of those plants called "weeds" in the territories and goes from landscape to landscape in order to discover stories of men and women tied to political movements. Then she combines those already existing iconographies to invent a new vocabulary using different media. Gabriella’s recent solo shows include: "La Stanza dello Scirocco" at prometeogallery (Milan, IT) 2016; Vert Magique, Amour Noir. KOMPLOT, Bruxelles, Belgium, 2014; All’Allerbaggio,Museo Villa Croce, Genova, Italy, 2013; Liberty Flowers,TUTTO project, 26Cc, Rome, Italy, 2012; Dalla Terronia Col Furgone, Black Box Gallery, Milan, Italy, 2011;Racconto di una relazione con le erbette aromatiche, Mambo, Bologna, Italy, 2011; If iu Fil Homsik, Tink in Dailect! RITRATTO IN NERO DI SEPPIA, Galleria S.A.C.S, PALAZZO RISO, Museo d’Arte Contemporanea della Sicilia, Palermo, Italy, 2010. Her group shows include: THE HUMAN CONDITION" at MMOMA (Moscow, RU) 2016; Nel Mezzo del Mezzo,PALAZZO RISO, Museo d’Arte Contemporanea della Sicilia, Palermo, Italy, 2015; Sous nos yeux, MACBA, Barcelona, Spain, 2014; Arte e scienza del gusto, Triennale di, Milano, Italy, 2014; Togli il Fermo (Leti t go), American Academy in Rome, Italy, 2013; Sous nos yeux (1 & 2), La Kunsthalle, Centre d'art contemporain Mulhouse, France, 2013; La materia di un sogno, Collezione Brodbeck, Fondazione Brodbeck, Catania, Italy, 2013; Bénin Biennale 2012: "Inventing World: The Artist as Citizen”,"Volume 1 project of Sentences on the banks and other activities at Darat al Funun (Amman, JO, 2010)"; Working For Change. Project for A Moroccan Pavilion at the 54th Venice Biennale 2011, Ex Birrerie Punch, Venice, Italy, 2011; Flowers, Animals, Urbans, Machines (fleurs, animaux, urbains, machines), L’Appartement 22, Rabat, Morocco, 2010. Here you can learn more about Manifesta in Palermo and Gabriela's participation. Article by Selina Oakes. GALLERY: Prometeogallery di Ida Pisani, Milan, Italy. SUPPORT: Gabriella Ciancimino’s two-month residency is made possible with support from private collectors and Promoteogallery in Milan, Italy.